Dalet Digital Media Systems today announced that the National Assembly of Mauritius has deployed an end-to-end Dalet Galaxy Media Asset Management (MAM) platform at the heart of its media operation, including managing the recording and live broadcast of parliamentary sessions. Dalet Digital Media Systems, a leading provider of solutions and services for media organizations, today announced that the National Assembly of Mauritius has deployed an end-to-end Dalet Galaxy Media Asset Management (MAM) platform at the heart of its media operation, including managing the recording and live broadcast of parliamentary sessions. The implementation, facilitated as a joint venture between Dalet, local partner HMT (Harel Mallac Technologies), and South Africa broadcast specialist Zimele Broadcast, is the latest instance of Dalet solutions being used by national and international government institutions to acquire, centralize, manage, produce and distribute official content to the public. The Mauritius National Assembly reached a landmark in its democratic process on 15 December 2016 when it began live broadcasting of the parliamentary proceedings. 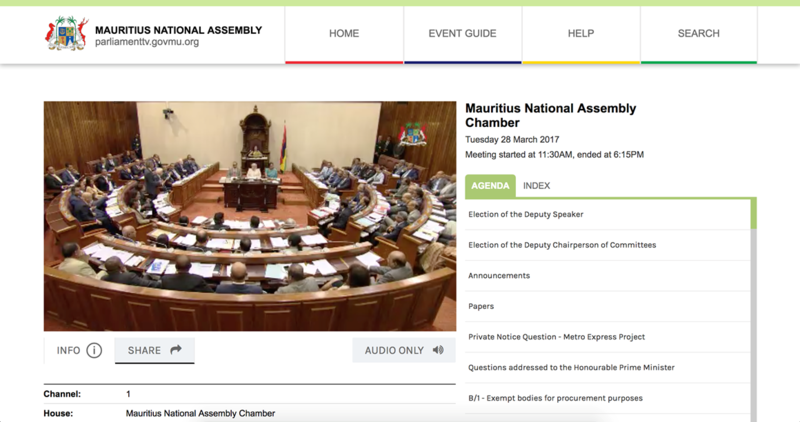 National Assembly staff enter the parliamentary order of business into Dalet planning tools, which, via the Dalet API, populate the Event Guide and Session Agenda on the Mauritius government website (https://parliamenttv.govmu.org). All cameras in the National Assembly’s main Chamber are recorded automatically onto high-density Dalet Brio video servers and with overlaid Dalet Cube graphics to identify each speaker, a live output is produced and simultaneously broadcast via Mauritius TV and streamed live via Unified Streaming servers on the online video platform. Galaxy workflow transfers the video automatically from Dalet Brio to NetApp online storage and later to Xendata systems for archiving. Operators log content using Dalet Events Logger, which appears instantly on the website as a timestamped index against the live stream. Dalet WebSpace users can later use the logs to search tags, select shots and create EDLs using Dalet OneCut for content production. Additionally, when there are no live sessions, Dalet OnAir can automate playout via Dalet Brio, incorporating graphics generated by Dalet Cube. The system has capacity to also record and stream the two National Assembly committee rooms when required. Dalet Galaxy’s open API provides key integration with the National Assembly of Mauritius’ Vualto online platform. The seamless connection allows members and the public to access recorded sessions and publish tweets and Facebook posts, as well as connect to other social media platforms with direct links to the video index. For more information, please visit Dalet at https://www.dalet.com. Cold desert mornings &amp; IMF conversations! The sound of an alarm clock breaking through the fog of last night's networking in the bar. It's still dark outside, but if I don't ride my bicycle then all those calories will turn me into a heavyweight of the industry. Two hours later, the warm shower has removed all traces of exercise except for the fixed smile of someone descending too fast when the temperature is 1°C. The dining tent at the Hollywood Professional Association Tech Retreat smells of bacon and coffee and I arrive 5 minutes early at the IMF DPP table. Rowan de Pomerai and myself have arranged this breakfast table to discuss the IMF activities of the DPP, especially the first SMPTE Technical Specification TSP 2121-1 that covers the use of ProRes in IMF. Welcome to the IMF DPP table... Good and bad news awaits me. I am early (a miracle), but the table is already full and there is no more space. This is great. It shows that there is genuine interest in the practical issues of IMF adoption from studios, broadcasters, vendors, post houses, content creators and just about everyone in the value chain. The conversation is wide ranging and covers key topics and highlighting the fact that IMF is concerned with the business of automating the content supply chain. Dalet's interest in the format should be obvious. A large company with a great track record in Asset Management, Media Orchestration and Cost optimization for its customers is pretty much a definition of what a standard like IMF is seeking to improve across the industry. "Why ProRes in IMF?" was the first big question and really it's all to do with efficiency. The BBC and many European companies have a lot of high quality original material in ProRes. Transcoding it to J2k before processing the high quality master seems like it would add cost without adding value, so ProRes was added to IMF. Dalet Galaxy five and Dalet AmberFin both handle ProRes MXF and DPP’s IMF flavor of TSP-2121. "Why a Specification and not a Standard?" was the next biggy. Fundamentally, the DPP wanted a document that could reference non-standards (like a SMPTE RDD and the way in which Control-Track audio description is used in the UK). The DPP wanted something with more public scrutiny than an RDD, but something that could be changed more dynamically than a full standard. This reflects the fact that the use of IMF in the TV market is likely to be quite dynamic for the first few years. As a result the DPP delivered the first of SMPTE's Technical Standards. IMF adoption and the API project Over the rest of the hour (and during the breakfasts on the next two days), we discussed adoption of IMF, the need for timeline metadata to allow program segmentation, the carriage of proxies and the identification of people on set. We discussed the provision of on-screen signing for the deaf and testing of the different IMF standards and specifications. On the final breakfast we discussed the new API project http://imf-mm-api.cloud. This counts Dalet as one of the project supporters and seeks to allow IMF applications to locate and use content managed by Asset Management Systems that might be local or remote. Open source code is due to be available at NAB 2019. Just before 9am, the gentle melody of the Breakfast Gong is sounded to indicate that we should all file into the Conference Room for the day's keynote. HPA Tech Retreat is a truly unique type of conference where deep discussions on real topics take place. The mindset of the entire industry changes direction at this conference every year. I, for one, feel privileged to attend. Interested in IMF? Get the white paper! Time flies! We are already one month into 2019, can you believe that? Now that we're fully immersed in the new year, let’s take a break. In this article, we list the blog articles that resonated most with our readers in 2018. 1 Empowering Multimedia Editors with Seamless Remote Workflows With the workforce becoming more globally spread than ever before, remote workflows are our reality and future. Get insights on how to support journalists in the field and find ways to better connect a globally distributed workforce with Dalet Editing Product Line Manager Golan Tsarfaty. #MultimediaEditing #RemoteWorkflows #GlobalWorkforce READ MORE 2 It’s Showtime! Introducing Dalet OnePlay We sat down with Dalet OnePlay Product Line Manager Raul Alba before IBC 2018 to get the lowdown on how to transform live production with studio automation and unleash untapped opportunities for broadcasters. #StudioAutomation #LiveProduction #AudienceEngagement Read more 3 Engaging Audiences in a Multiplatform World - A Report from IBC 2018 While IBC stayed true to its B2B roots, last year’s edition finally put the audience at the very center of every conversation, workflow and applied technology demonstration. For broadcasters and media organizations, it highlighted one thing: the need for greater agility, faster adaptation and collaborative innovation. Not only do media professionals need to think “out of the box” about linear broadcast and traditional consumption formats and devices, but they need to think tactically on how to build meaningful, complementary content experiences. #IBCShow #Audience #ContentExperiences READ MORE 4 Bringing Broadcast Archives to Life! Did you miss the FIAT-IFTA 2018 World Conference? Discover how leading broadcasters connect their content to opportunities leveraging AI-powered, content management and archiving technologies. #FIATIFTA #Archives #AI Read more 5 IMF, the Age of Reason – Key Takeaways from HPA Tech Retreat The annual gathering of media technology leaders and innovators in Hollywood is always a unique occasion to feel the pulse of the industry. This year was no different and a perfect opportunity to witness how mature and ready IMF workflows have become. Game on! #HPATechRetreat #IMFFormat #ContentVersioning Read more Stay tuned for new captivating and trendy topics around AI &amp; Machine Learning in media workflows, next-gen news operations, education, MAM, program preparation and versioning, content monetization strategies, as well as key product launches trade shows key takeaways. If not already done, subscribe to Dalet’s Newsletter and follow us on Twitter, Facebook, LinkedIn and YouTube. Don't hesitate to share with us your ideas or propose topics that are of interest to you! Dalet, a leading provider of solutions and services for broadcasters and content professionals, will showcase and explain its market-leading sports content solutions with its award-winning Dalet Galaxy five media asset management (MAM) and workflow orchestration platform at the SportsInnovation 2018 conference held in Düsseldorf, Germany, from May 8-9, on stand P1. Dalet addresses the entire sports content life cycle with a holistic approach, empowering organizations through a streamlined “conception-to-consumption” paradigm by unifying content acquisition &amp; analysis with fast-paced highlights, live show production control in parallel with its multiplatform publishing. “The agile Dalet platform unifies assets and resources, allowing you to connect remote teams and sites to a data model and framework that provides actionable insights and supports augmented productions workflows to monetize sports assets and create the ultimate fan experience across all channels,” comments Luc Comeau, head of sports strategy, Dalet. “At SportsInnovation 2018, we will showcase how practical applications of these new frameworks and purpose-built sports content capabilities, including new artificial intelligence integrations, comprehensive social media operations and hybrid workflows, manage all stages of the media lifecycle and deliver more value to the organisation right here and now, while building a robust and flexible foundation for continuous adaptation.” Optimized Sports Data Management With integration for industry standard sports feeds and cognitive services such as Face Recognition, Dalet augments sports organizations’ existing live and archival content data sets with comprehensive external data, expediting the overall content enrichment process. Users can then leverage Dalet’s fast production tools to quickly locate best possible assets to use from inventory and make informed decisions that enhance audience engagement or facilitate further monetization and licensing opportunities of the assets. Building a Living Sports Library - The Sportcast Example Sportcast, a subsidiary of DFL-Bundesliga, has implemented Dalet as its “Living Library.” Providing the host signal in HD and capturing sports data via OPTA integration, Sportcast manages the archives for all Bundesliga matches. The volume of content housed in the DFL's 5 PetaBytes vaults increases by approximately 5,000 hours a year. Dalet Galaxy offers Sportcast a unified catalogue and core infrastructure complemented by orchestrated workflows and task-specific tool sets for each business area enabling media organizations like DFL Bundesliga to deploy a single MAM for individual parts of the business or enterprise-wide. Other Dalet sports customers include teams and venues such as the Los Angeles Dodgers and Lakers (Spectrum Sports), OM TV, Benfica TV, and Toronto Maple Leafs; broadcasters and networks such as Mediaset, CBS Sports, Fox Sports 1 and Perform to name a few. New Dalet Galaxy five Capabilities shown at SportsInnovation 2018 Dalet Galaxy five delivers a number of important functional enhancements and three major technology innovations that augment sports media operations and enable new sports workflows. The first enables sports organizations to leverage AI across the workflow, the second leverages hybrid infrastructures with on-premises and Cloud deployments, and the third puts digital and social media at the core of the operations. SportsInnovation 2018 attendees can book a private demonstration or workflow consultation with a Dalet expert to learn more about the new Dalet Galaxy five feature highlights. More on Dalet Sports Solutions Dalet Sports Solution enables fast-paced, effective game-to-fans workflows by leveraging the Dalet Galaxy five unified and collaborative platform, empowering sports organizations such as broadcasters, venues and federations with a new set of content production, management, and distribution tools, as well as powerful audience engagement capabilities. Learn more: http://www.dalet.com/solutions/unified-sports-content-operations Dalet Press Briefings at SportsInnovation 2018 To schedule a press briefing with Dalet, please contact Alex Molina at alex@zazilmediagroup.com. About Dalet Digital Media Systems Dalet solutions and services enable media organizations to create, manage and distribute content faster and more efficiently, fully maximizing the value of assets. Dalet products are built on three distinct platforms that, when combined, form versatile business solutions that power end-to-end workflows for news, sports, program preparation, production, archive and radio. Individually, Dalet platforms and products offer targeted applications with key capabilities to address critical media workflow functions such as ingest, QC, edit, transcode and multiplatform distribution. The foundation for Dalet productivity-enhancing workflow solutions, Dalet Galaxy is the enterprise Media Asset Management (MAM) &amp; Orchestration platform that unifies the content chain by managing assets, metadata, workflows and processes across multiple and diverse production and distribution systems. Specially tailored for news and media workflows, this unique technology platform helps broadcasters and media professionals increase productivity while providing operational and business visibility. Dalet AmberFin is the high-quality, scalable transcoding platform with fully integrated ingest, mastering, QC and review functionalities, enabling facilities to make great pictures in a scalable, reliable and interoperable way. Addressing the demanding needs of studio production, multi-camera ingest, sports logging and highlights production, the innovative Dalet Brio video server platform combines density and cost-effectiveness with high reliability. Adopted by leading broadcasters, Dalet Cube is a suite of applications to create, manage and deliver graphics in a newsroom scenario. Dalet supports customers from the initial planning stages to well beyond project execution. Our global presence includes 17 offices strategically located throughout Europe, the Middle East, Asia Pacific, North America and South America, and a network of more than 60 professional partners serving 87 countries worldwide. This collective experience and knowledge enables our customers to realize potential increases in productivity, efficiency and value of their assets. The comprehensive Dalet Care program ensures deployments remain up and running with 24/7 support 365 days a year. Dalet systems are used around the world by many thousands of individual users at hundreds of TV and Radio content producers, including public broadcasters (ABS-CBN, BBC, CBC, DR, FMM, France TV, RAI, RFI, Russia Today, RT Malaysia, VOA), commercial networks and operators (Canal+, FOX, eTV, MBC Dubai, MediaCorp, Mediaset, Orange, Time Warner Cable, Warner Bros, Sirius XM Radio), and government organizations (Canadian House of Commons, Australian Parliament and UK Parliament). Dalet is traded on the NYSE-EURONEXT stock exchange (Eurolist C): ISIN: FR0011026749, Bloomberg DLT:FP, Reuters: DALE.PA. Dalet® is a registered trademark of Dalet Digital Media Systems. All other products and trademarks mentioned herein belong to their respective owners. Dalet, a leading provider of solutions and services for broadcasters and content professionals, announced that BBC Wales has selected the enterprise Dalet Galaxy Media Asset Management (MAM) and Orchestration platform to facilitate all workflows and asset management requirements at its new state-of-the-art media facility located in Cardiff, Wales. Once deployed, Dalet Galaxy will offer a centralized content repository and provide tools to orchestrate workflows and media processes across production, news, studios and delivery departments. The massive installation design and multi-year deployment will be managed by Dalet Professional Services, which will ensure customer success in the transformation journey towards agility and maximize return on investment (ROI). “BBC Wales is pleased to be working with Dalet to provide an asset management system for our new home in Central Square, Cardiff. Dalet was chosen after a very competitive process, and will provide an important part of the technology solution at Central Square within a state of the art broadcast centre. We are looking forward to the successful delivery of the project,” comments Gareth Powell, chief operating officer, BBC Wales. As the core media hub, Dalet Galaxy will be deployed as the cornerstone of the new digital facility. All systems and sub-systems deployed in future phases will connect to this hub. The state-of-the-art, BPMN-compliant Dalet Workflow Engine will enable the BBC to orchestrate a combination of user tasks and media services ranging from ingest, transcoding and QC, to logging, editing, media packaging and distribution. A simple-to-use workflow designer interface allows users to model business processes, picking from a palette of stencils operations such as user tasks and notifications, media and metadata services, gateways, timeout and error management, and much more. The comprehensive and open Dalet Galaxy API will allow the BBC to tightly connect storage and infrastructure technologies, media services and post-production applications, and traffic and business platforms, orchestrating a fluid workflow that tracks assets and associated metadata across the media enterprise. “We have been working with the BBC on a multitude of projects for more than fifteen years," comments Adrian Smith, regional manager, Dalet UK. “Dalet Galaxy’s flexible architecture provides a future-proof framework on which the BBC can evolve to meet new requirements and production needs that arise over coming months and even years. The Dalet Professional Services team’s experience in managing such enterprise rollouts will help them navigate the juggernaut of this multi-year, large-scale deployment.” In addition to Dalet Galaxy, Dalet will be supplying a new Dalet HTML application for simplified management of camera card ingests and its Dalet Brio video server. Supporting both SDI and IP, the versatile, high-density Dalet Brio ingest and playout platform adheres to the SMPTE 2110 standards, allowing broadcasters to step into the future of IP while retaining the security of SDI. About Dalet Digital Media Systems Dalet solutions and services enable media organizations to create, manage and distribute content faster and more efficiently, fully maximizing the value of assets. Dalet products are built on three distinct platforms that, when combined, form versatile business solutions that power end-to-end workflows for news, sports, program preparation, production, archive and radio. Individually, Dalet platforms and products offer targeted applications with key capabilities to address critical media workflow functions such as ingest, QC, edit, transcode and multiplatform distribution. The foundation for Dalet productivity-enhancing workflow solutions, Dalet Galaxy is the enterprise NRCS and MAM that unifies the content chain by managing assets, metadata, workflows and processes across multiple and diverse production and distribution systems. Specially tailored for news and media workflows, this unique technology platform helps broadcasters and media professionals increase productivity while providing operational and business visibility. Dalet AmberFin is the high-quality, scalable transcoding platform with fully integrated ingest, mastering, QC and review functionalities, enabling facilities to make great pictures in a scalable, reliable and interoperable way. Addressing the demanding needs of studio production, multi-camera ingest, sports logging and highlights production, the innovative Dalet Brio video server platform combines density and cost-effectiveness with high reliability. Dalet supports customers from the initial planning stages to well beyond project execution. Our global presence includes 17 offices strategically located throughout Europe, the Middle East, Asia Pacific, North America and South America, and a network of more than 60 professional partners serving 87 countries worldwide. This collective experience and knowledge enables our customers to realize potential increases in productivity, efficiency and value of their assets. The comprehensive Dalet Care program ensures deployments remain up and running with 24/7 support 365 days a year. Dalet systems are used around the world by many thousands of individual users at hundreds of TV and Radio content producers, including public broadcasters (ABS-CBN, BBC, CBC, DR, FMM, France TV, RAI, RFI, Russia Today, RT Malaysia, VOA), commercial networks and operators (Canal+, FOX, eTV, MBC Dubai, MediaCorp, Mediaset, Orange, Time Warner Cable, Warner Bros, Sirius XM Radio), and government organizations (Canadian House of Commons, Australian Parliament and UK Parliament). Dalet is traded on the NYSE-EURONEXT stock exchange (Eurolist C): ISIN: FR0011026749, Bloomberg DLT:FP, Reuters: DALE.PA. Dalet® is a registered trademark of Dalet Digital Media Systems. All other products and trademarks mentioned herein belong to their respective owners. For more information on Dalet, visit www.dalet.com. About BBC Wales BBC Cymru Wales is the national broadcaster for Wales, providing a wide range of English and Welsh language programmes and services for audiences across Wales, as well as flagship programmes for the BBC network. It has the largest BBC newsroom outside London, serving audiences across Wales with live news across television, radio and digital platforms seven days a week. Dalet, a leading provider of solutions and services for broadcasters and content professionals, will demonstrate new technology advancements at the Inter BEE 2017 event (Hall 4 stand 4502) held in Chiba, Japan November 15th through 17th. Headlining the Dalet demonstrations is the company’s flagship media asset management (MAM) and orchestration platform, Dalet Galaxy. “To optimize efficiencies, sports, news and program preparation, multiplatform distribution and archive workflows need to be considered at the heart of the operations, and not as an afterthought or a siloed process. The Dalet Galaxy MAM and orchestration platform is key to enabling efficiencies across these media verticals,” comments Takato Yamaguchi, Dalet Regional Manager. “A governance layer, Dalet Galaxy manages the stock and the preparation flow of all the program elements needed for outbound content on all distribution channels as well as those targeted for archive. Dalet experts will be available to talk with broadcasters and media companies about how Dalet Galaxy MAM and Orchestration capabilities can improve program prep, multiplatform distribution and archive efficiencies and ways they can transform their media operation and ultimately their business.” Attendees to Inter BEE 2017 can book a private briefing with Dalet at http://www.dalet.com/events. Orchestrating and Streamlining Enterprise Media Workflows Dalet Galaxy is designed to integrate content pools and automate workflows across different verticals – such as programs, promos, news, sport, lifestyle and more. It provides a consolidated view of all media assets across the business with tools to easily automate and optimize workflows from acquisition to production and distribution of content to multiple broadcast platforms and publishing systems. Delivered with Dalet Report Center, Dalet Galaxy offers critical analytics specifically tailored for media operations, allowing management teams to measure performance throughout the chain and build data-driven strategies. Dalet Galaxy MAM and Orchestration does not substitute existing MAM systems, but rather integrates them to access the media assets they hold and facilitate coherent enterprise-wide workflows. It presents a very cost-effective and “media aware” alternative to the classic and costly approach of deploying a generic ESB. Extensive Integration Ecosystem The Dalet Galaxy comes with a wide range of out-of-the-box connectors, from industry standards to custom-built partner technology integrations. These integrations range from simple connectors for file-based exchanges with applications such as file transfer engines, HSM, QC, media transcoders and content analysis; to complex adaptors for asset-based exchanges, enabling bi-directional communication with systems such as PAM/MAM/DAM, CMS, OVP, NRCS, graphic systems, traffic, scheduling and billing. For the more tech-savvy organizations, the Dalet Galaxy WebServices API allows for any ad hoc integration to be developed in-house or by a contractor. Deeper Integration with Adobe Premiere Pro CC The critical connect point for post-production, the recently updated HTML5 Dalet Xtend panel connects Adobe® Premiere Pro® CC users to the Dalet Galaxy platform, providing a direct gateway to shared assets and facilitating greater collaboration with the rest of the users on the Dalet Galaxy platform – such as journalists, prep editors, sports producers and other production personnel. Editors can save projects or sequences as assets in Dalet Galaxy, and share them with other Adobe Premiere Pro editors connected to Dalet. New features and capabilities include support for multi-sequence export, locator inheritance, configurable metadata forms for exporting content and support for “while” scenarios when exporting from Adobe Premiere Pro. Cloud Enabled Further to that, when it comes to leveraging cloud capabilities, Dalet Galaxy is a real enabler, allowing to combine in a single workflow a mix of processes that use dedicated, on-premise resources and processes that dynamically consume Software-as-a-Service (SaaS) solutions. The framework is also ready for next-generation adaptors to connect new types of services such as artificial intelligence (AI) models that need to be driven with context and feedback. Video-Over-IP and Virtualizing Your I/O Server The Dalet Brio high-density I/O platform supports the latest IP standards adopted across the industry – SMPTE 2202-2, SMPTE 2202-6 and the recently published SMPTE 2110. The latest version of Dalet Brio no longer has dependency on a physical video board, allowing for a full virtualization of the I/O service, opening doors to more agile, next-generation video network configurations. About Dalet Digital Media Systems Dalet solutions and services enable media organizations to create, manage and distribute content faster and more efficiently, fully maximizing the value of assets. Dalet products are built on three distinct platforms that, when combined, form versatile business solutions that power end-to-end workflows for news, sports, program preparation, production, archive and radio. Individually, Dalet platforms and products offer targeted applications with key capabilities to address critical media workflow functions such as ingest, QC, edit, transcode and multiplatform distribution. The foundation for Dalet productivity-enhancing workflow solutions, Dalet Galaxy is the enterprise Media Asset Management (MAM) &amp; Orchestration platform that unifies the content chain by managing assets, metadata, workflows and processes across multiple and diverse production and distribution systems. Specially tailored for news and media workflows, this unique technology platform helps broadcasters and media professionals increase productivity while providing operational and business visibility. Dalet AmberFin is the high-quality, scalable transcoding platform with fully integrated ingest, mastering, QC and review functionalities, enabling facilities to make great pictures in a scalable, reliable and interoperable way. Addressing the demanding needs of studio production, multi-camera ingest, sports logging and highlights production, the innovative Dalet Brio video server platform combines density and cost-effectiveness with high reliability. Adopted by leading broadcasters, Dalet Cube is a suite of applications to create, manage and deliver graphics in a newsroom scenario. Dalet supports customers from the initial planning stages to well beyond project execution. Our global presence includes 17 offices strategically located throughout Europe, the Middle East, Asia Pacific, North America and South America, and a network of more than 60 professional partners serving 87 countries worldwide. This collective experience and knowledge enables our customers to realize potential increases in productivity, efficiency and value of their assets. The comprehensive Dalet Care program ensures deployments remain up and running with 24/7 support 365 days a year. Dalet systems are used around the world by many thousands of individual users at hundreds of TV and Radio content producers, including public broadcasters (ABS-CBN, BBC, CBC, DR, FMM, France TV, RAI, RFI, Russia Today, RT Malaysia, VOA), commercial networks and operators (Canal+, FOX, eTV, MBC Dubai, MediaCorp, Mediaset, Orange, Time Warner Cable, Warner Bros, Sirius XM Radio), and government organizations (Canadian House of Commons, Australian Parliament and UK Parliament). Dalet is traded on the NYSE-EURONEXT stock exchange (Eurolist C): ISIN: FR0011026749, Bloomberg DLT:FP, Reuters: DALE.PA. Dalet® is a registered trademark of Dalet Digital Media Systems. All other products and trademarks mentioned herein belong to their respective owners. For more information on Dalet, visit www.dalet.com. Dalet, a leading provider of solutions and services for broadcasters and content professionals, announced that Australia’s Special Broadcasting Service (SBS) is significantly expanding the portion of its media operations powered by the Dalet Galaxy Media Asset Management (MAM) and Orchestration platform. The new implementation will facilitate production and distribution of news, sports, radio programs in multiple languages and music content across the broadcaster’s TV, radio and digital platforms. The new deployment will bolster SBS’s production capability prior to the 2018 FIFA World Cup. Building on the successful integration of dozens of systems and automation of several program management workflows under a unified Dalet Galaxy environment, the expanded installation will now encompass news and sports production as well as the full radio automation for SBS music channels. This will deliver production content to three TV channels, eight radio channels (music and talk show), the SBS website and online apps. SBS’s radio programming is produced in more than 70 languages, making it the most linguistically diverse broadcaster globally. In addition to the 2018 FIFA Football World Cup, the production of other sporting events that will be facilitated by the new integration includes tier-one events such as the Tour de France and English Premiere League. SBS’s Chief Technology Officer, Noel Leslie, said, “Following the first phase of our strategic move to streamline our programming content under the management of a single MAM platform, we embarked on phase two in full confidence of our partnership with Dalet. SBS and Dalet teams have worked collaboratively on the software commissioning and the system integration for this project. Change management is also extremely important to us at SBS, and we have made it core to our strategy to involve key stakeholders across the chain and across our geographically spread operation right from the start of the process.” The system will be deployed across four sites including SBS headquarters in Sydney, connected production operation in Melbourne, a third system in Canberra, and a Business Continuity (BC) / Disaster Recovery (DR) site also in Sydney. Specifically, Dalet will unify content preparation, production and ingest at two TV studios and eight radio studios in Sydney and an additional eight radio studios in Melbourne, bringing together up to 300 simultaneous users working with the system. Video ingest for 50 channels spread across the country, alongside multiple channels of audio ingest, will be centrally managed under the control of Dalet. The Dalet AmberFin media processing platform will assist with transcoding as required. Dalet On-the-Go will also be available to connect journalists in the field directly to the central Dalet Galaxy platform. Dalet OneCut is provided for desktop editing and remote editing at the Canberra studios. Industry-standard, BPMN 2.0-compliant Dalet Workflow Engine automates multi-platform publishing, including social media workflows, as well as archiving operations. “There are many tangible benefits SBS will receive by further standardizing production under one unified environment; lower TCO, optimized support and training costs, fewer systems to integrate – all thanks to the powerful agility and extensibility of the Dalet Galaxy platform,” said Raoul Cospen, Dalet Product Manager. “Using the full scope of the Dalet platform, SBS is able to unite and streamline its content collaboration across geographically diverse SBS departments, and orchestrate the program acquisition, preparation and distribution workflows.” The Dalet Galaxy open APIs are used for a variety of interfaces with third parties including music scheduling system Power Gold and Adobe® Premiere® Pro CC for craft editing across the three production sites, and Opta Sports data feeds. Integrations with Dell EMC® Elastic Cloud Storage (ECS™) provide SBS teams with a single user interface to easily access and manage content. Further integrations facilitated by Dalet include Ross Overdrive in SBS’s automated production studio, Ross Expression for graphics and content management system Drupal. Integrations with social media networks Facebook, Twitter and YouTube make this installation a complete end-to-end solution for SBS to address effectively their audiences across all available platforms. Noel Leslie (Chief Technology Officer at SBS), Stephane Schlayen (COO at Dalet), Raoul Cospen (Product Manager at Dalet) and Darren Farnham (Manager at SBS) About SBS As Australia’s multicultural broadcaster, SBS holds a unique place in the Australian media landscape, inspiring all Australians to explore, appreciate and celebrate our diverse world and in doing so, contributes to a cohesive society. As described in the SBS Charter, SBS’s principal function is to provide multilingual, multicultural and Indigenous radio, television and digital media services that inform, educate and entertain all Australians. Today, SBS is a modern, multiplatform media organisation and carries out this function across a TV portfolio spanning five distinctive channels on free-to-air and subscription TV; an extensive radio service providing more than 70 communities with programs in their own language; and an innovative and growing online and digital presence ensuring SBS is responding to the changing needs and demands of audiences. For more information visit sbs.com.au. About Dalet Digital Media Systems Dalet solutions and services enable media organizations to create, manage and distribute content faster and more efficiently, fully maximizing the value of assets. Dalet products are built on three distinct platforms that, when combined, form versatile business solutions that power end-to-end workflows for news, sports, program preparation, production, archive and radio. Individually, Dalet platforms and products offer targeted applications with key capabilities to address critical media workflow functions such as ingest, QC, edit, transcode and multiplatform distribution. The foundation for Dalet productivity-enhancing workflow solutions, Dalet Galaxy is the enterprise Media Asset Management (MAM) &amp; Orchestration platform that unifies the content chain by managing assets, metadata, workflows and processes across multiple and diverse production and distribution systems. Specially tailored for news and media workflows, this unique technology platform helps broadcasters and media professionals increase productivity while providing operational and business visibility. Dalet AmberFin is the high-quality, scalable transcoding platform with fully integrated ingest, mastering, QC and review functionalities, enabling facilities to make great pictures in a scalable, reliable and interoperable way. Addressing the demanding needs of studio production, multi-camera ingest, sports logging and highlights production, the innovative Dalet Brio video server platform combines density and cost-effectiveness with high reliability. Adopted by leading broadcasters, Dalet Cube is a suite of applications to create, manage and deliver graphics in a newsroom scenario. Dalet supports customers from the initial planning stages to well beyond project execution. Our global presence includes 17 offices strategically located throughout Europe, the Middle East, Asia Pacific, North America and South America, and a network of more than 60 professional partners serving 87 countries worldwide. This collective experience and knowledge enables our customers to realize potential increases in productivity, efficiency and value of their assets. The comprehensive Dalet Care program ensures deployments remain up and running with 24/7 support 365 days a year. Dalet systems are used around the world by many thousands of individual users at hundreds of TV and Radio content producers, including public broadcasters (ABS-CBN, BBC, CBC, DR, FMM, France TV, RAI, RFI, Russia Today, RT Malaysia, VOA), commercial networks and operators (Canal+, FOX, eTV, MBC Dubai, MediaCorp, Mediaset, Orange, Time Warner Cable, Warner Bros, Sirius XM Radio), and government organizations (Canadian House of Commons, Australian Parliament and UK Parliament). Dalet is traded on the NYSE-EURONEXT stock exchange (Eurolist C): ISIN: FR0011026749, Bloomberg DLT:FP, Reuters: DALE.PA. Dalet® is a registered trademark of Dalet Digital Media Systems. All other products and trademarks mentioned herein belong to their respective owners. For more information on Dalet, visit www.dalet.com. This Q&amp;A article is a repost from The Broadcast Bridge website. Kevin Savina, Product Strategy Director for Dalet, discusses with The Broadcast Bridge important 2017 trends in media asset management – multi-platform distribution, collaboration, workflow orchestration and business intelligence reporting – that broadcasters, facilities and content producers should keep at the forefront of their decision-making. The Broadcast Bridge (TBB): How are changing audience consumption habits combined with the continued rise of social media impacting multi-platform distribution? Kevin Savina (KS): In order to be addressed efficiently, Multiplatform distribution workflows need to be considered at the heart of the operations, and not as an afterthought. The MAM solution is key to enabling efficiency in this process. Not only does it need to manage the stock and the preparation flow of all the program elements needed for outbound content on all distribution channels, but it also needs to cater for a return path of data, and even more so with social channels. Let’s start withthe program preparation aspect. In multi-platform distribution, we still face challenges of similar nature as the ones traditional linear broadcasting faces - dealing with multiple languages, multiple audio tracks, multiple subtitle tracks, and different delivery formats - but these need to be taken to a much larger scale. By providing the right toolset and automating the packaging process, the combination of MAM &amp; orchestration optimizes that preparation, facilitating a much more efficient multi-platform distribution workflow. Now let’s move to the aspect of the return data path from the distribution platforms back into the MAM, as it is key for collecting important data on content performance. Typically, traditional MAM solutions preparing content for delivery on linear channels have not been concerned with any consumption data flowing back. But with digital platforms (OTT and social media), this data is now available and not tapping into it for new strategies is a missed opportunity. To lay properly the foundation for the new ‘game’, these data sources should be connected back to the MAM, mapped in the data model, and made available in various aggregates, to various users groups, at various stages, in order drive more informed decisions at the editorial and content preparation level, as well as longer term strategies. COLLABORATION TBB Question: We operate in a work-anywhere world with multi-disciplinary teams, how is MAM keeping pace with this trend? KS: MAM started out as the platform to manage your media assets, but has now evolved into a solution that manages workflows to prepare these assets. To do this efficiently, it is not enough to manage access rights and share content, you need native collaboration tools. Having users accessing the system from different locations, over secured web clients or mobile applications allows for distributed teams to operate. Providing built-in chat and notification tools ensures they operate with maximum productivity. And finally, providing solutions for multi-site operations, brings together cross-geography workflows, making the walls of separate offices &amp; facilities a distant memory. The combination of these tools, if done right, can turn the MAM into a true collaboration platform. WORKFLOW ORCHESTRATION TBB Question: We have more content to produce, more tasks to manage, more technologies to connect, more changes to come – how is workflow orchestration evolving to manage the growing demands? KS: Well, there is indeed a need for workflow orchestration to optimize efficiency around MAM driven workflows. From a design perspective, there has always been a divide between 2 schools of thought: should orchestration be part of the MAM platform or a separate system? There is no definite answer to this question, but I would tend to believe that the most efficient solution is to have an orchestration layer very closely coupled to the MAM. This scenario would make full use of the comprehensive metadata available in the MAM to drive business rules as well as ensure consistency when continuously changing these business rules and operations – as mentioned in the first topic. Our choice has been to have orchestration as an open component that is natively integrated with the MAM. If we look at the orchestration component itself, it needs to be a BPM platform based on standards such as BPMN 2.0, which will orchestrate a combination of automated technical processes and human tasks/operations. This is key to efficiency. Any partial solution will limit what can be accomplished. What’s interesting today is that we even see some organisations, who already have MAM systems in place, but no built-in orchestration, looking for solutions like Dalet as a complementary layer that facilitates workflows across their legacy siloes, improving efficiency and bringing visibility at a higher level. CLOUD TBB Question: Cloud – what can we expect from MAM &amp; the Cloud? KS: Well, let me start by making an important distinction between “MAM in the Cloud” and “MAM and the Cloud”. In general, moving some part of an operation to Cloud is not just a technology change, it will also affect other areas such as financial planning, operations, personnel, etc... As such it typically requires a transition phase. A first approach, that we see with our customers is what I would call “MAM and the Cloud”. It consists, in keeping a traditional MAM solution, running on premise, but taking advantage of some Cloud services as IaaS (Compute and Storage on AWS or Azure are the most common) but also some SaaS services. It does not fundamentally change the MAM operations work, but it does bring a significant first layer of flexibility to our customers. A second approach would be “MAM in the Cloud”. There you have the whole MAM system running in the Cloud. There are some customers that have made this move to “All-in on Cloud”, but very few so far. What we expect to see more often is what I would call ‘Edge Cloud Workflows’, whereby we work with our customers to provide a ‘Cloud-based solution’ to a specific existing business or workflow problem and nicely integrate this with their pre-existing workflow. The key aspect here is that this gives full flexibility to our customers to decide what area makes the most sense to gradually implement in the Cloud. BUSINESS INTELLIGENCE TBB Question: How is MAM helping content owners collect, model and exploit data? KS: “Data-driven” is one of the current buzz-words of Management Gurus. Well, if you look at the point of view of the broadcasters and content owners, a well-structured MAM back-end, tightly combined with orchestration is the only way to enable data-driven media operations. First, to build the proper data model for a data-driven media strategy you need to combine: The metadata - of the media assets, their taxonomy and the relationships between assets (available in the MAM) The data about the users the groups they pertain to and their rights (available in the MAM) the time they spend on their tasks (available in the BPM) The data fed back from audiences on each asset (available in the MAM) The data about the infrastructure and all the connected software services (combining data available in the MAM and in the BPM) Then to make it actually usable for decisions you need to consolidate this data and aggregate it into actionable insight for various users and in various tools: In the MAM and its production tools In the BPM, the tasks it displays or its provisioning algorithms In the BI and the set of reports it facilitates CLOSING The key question to ask is whether the MAM will respond to the business requirements of your facility. Can it enable true integration between silos of production? Can it offer you the services you need in such a way that the cost savings can be established without compromising the quality of the content produced? Is it sufficiently scalable and extensible so that it can deliver the agility required to respond to new business and new business models? What would be required to add a new broadcast channel? What would it take to deliver content out to a new content distribution network? What would it take to integrate a new content production unit? What would it take to rapidly scale up the number of users? How is it integrated with the Cloud? These are the essential features that will ensure you are truly future-proofing your facility. Dalet Digital Media Systems, a leading provider of solutions and services for media organizations, is taking on the post-production market with Colortime, a Burbank, California-based post-production facility that specializes in feature film and television episodic editorial, dailies, VFX, color correction and content management services for a global customer base. Like many post facilities, Colortime is faced with an increasing number of versions to produce while simultaneously reducing the time to deliver those versions to various content channels. Taking a different approach to the traditional work arounds and spreadsheet management tools, industry veteran Moshe Barkat turned to Dalet for its expertise in workflow automation and media asset management (MAM), selecting the open, ready-made Dalet Galaxy platform. The new workflow, which will include Dalet Galaxy MAM and Workflow Engine, Dalet WebSpace and Storyboarder and Dalet Xtend for Adobe® Premiere® Pro, aims to maximize efficiency for managing client content and package delivery by connecting post-production and archives as well as managing work orders for file delivery and automating the corresponding transcodes. “We are managing a massive amount of content for a growing client base and required a solution that would provide both content organization features and automation capabilities with high scalability. We found the Dalet Galaxy platform delivers on all of these needs,” states Moshe Barkat, CEO of Colortime. “For the many clients and brands that we work with, it is critical that the content is organized in a manner that allows both Colortime and the client - or even the client’s client – to efficiently access it and distribute it in any format they require during or after post.” Moshe elaborates, “Dalet Galaxy will serve as the foundation to efficiently organize and easily retrieve the vast amount of files we store across post-production storage servers and archives. It will also allow us to simplify distribution, by creating automation profiles for the many transcode and package assembly jobs we do at Colortime, saving us quite a bit of time, whether it is a final file delivery or pulling content from the archive in a particular format that a client needs.” Dalet Galaxy will manage content ingest and metadata indexing onto Colortime storage and archive servers, creating a central content repository for a 360-degree view into assets. Purpose-built applications such as Dalet WebSpace will allow staff to quickly browse the repository and review work in progress or archived content from any laptop or workstation. Dalet Storyboarder will provide simple cuts and assembly capabilities, allowing non-editing staff to storyboard and share concepts. Dalet Xtend for Adobe Premiere will connect editors to the main content pool with bi-directional metadata tracking across all systems, keeping content easily searchable throughout the post process. “From workgroup to enterprise implementations, Dalet continues to prove that its renowned MAM and media workflow technology - honed over years of project experience - is capable of assisting customers not only in broadcast operations, but also in multi-screen distribution and post-production,” states Simon Adler, General Manager, West Coast USA &amp; Canada, Dalet. “Our continued investments in R&amp;D allow our offer to remain flexible and constantly adapt to new market demands. As the chain between content producers and the audiences keeps getting more integrated and faster, post-production and media services facilities have a tremendous new business opportunity to grasp, provided they build their operations on top of the right technology foundation. We see this project as a key reference in this new generation.” The Dalet Workflow Engine will seamlessly integrate with Colortime’s existing Dalet AmberFin installation, near eliminating the need to manually transcode files and organize final packages. “We will use the Dalet Workflow Engine to automate the many different client file delivery requirements,” says Bill Womack, CTO of Colortime. “Combined with our Dalet AmberFin installation, Dalet will facilitate creation-on-demand for many customer deliverables that require transcoding. And from a top down view, the Workflow Engine will let us define certain governance or rules to manage work orders and orchestrate the creation of packages for each client.” Bill explains the complexity in automating this aspect of the business: “The automation process is rules-based and unique to each client, which you don’t typically see in television or broadcast environment, as they’re only developing content for their own proprietary channels. They don’t have the same breadth of workflows or depth of rules that we are working with. Being able to dial into each client and define a profile innovates the way we deliver content and customer service.” About Dalet Digital Media Systems Dalet software-based solutions enable media organizations to create, manage and distribute content faster and more efficiently, fully maximizing the value of assets. Dalet products are built on three distinct platforms that, when combined, form versatile business solutions that power end-to-end workflows for news, sports, program preparation, production, archive and radio. Individually, Dalet platforms and products offer targeted applications with key capabilities to address critical media workflow functions such as ingest, QC, edit, transcode and multiplatform distribution. The foundation for Dalet productivity-enhancing workflow solutions, Dalet Galaxy is the enterprise NRCS and MAM that unifies the content chain by managing assets, metadata, workflows and processes across multiple and diverse production and distribution systems. Specially tailored for news and media workflows, this unique technology platform helps broadcasters and media professionals increase productivity while providing operational and business visibility. Dalet AmberFin is the high-quality, scalable transcoding platform with fully integrated ingest, mastering, QC and review functionalities, enabling facilities to make great pictures in a scalable, reliable and interoperable way. Addressing the demanding needs of studio production, multi-camera ingest, sports logging and highlights production, the innovative Dalet Brio video server platform combines density and cost-effectiveness with high reliability. Dalet supports customers from the initial planning stages to well beyond project execution. Our global presence includes 17 offices strategically located throughout Europe, the Middle East, Asia Pacific, North America and South America, and a network of more than 60 professional partners serving 87 countries worldwide. This collective experience and knowledge enables our customers to realize potential increases in productivity, efficiency and value of their assets. The comprehensive Dalet Care program ensures deployments remain up and running with 24/7 support 365 days a year. Dalet systems are used around the world by many thousands of individual users at hundreds of TV and Radio content producers, including public broadcasters (ABS-CBN, BBC, CBC, DR, FMM, France TV, RAI, RFI, Russia Today, RT Malaysia, VOA), commercial networks and operators (Canal+, FOX, eTV, MBC Dubai, MediaCorp, Mediaset, Orange, Time Warner Cable, Warner Bros, Sirius XM Radio), and government organizations (Canadian House of Commons, Australian Parliament and UK Parliament). Dalet is traded on the NYSE-EURONEXT stock exchange (Eurolist C): ISIN: FR0011026749, Bloomberg DLT:FP, Reuters: DALE.PA. Dalet® is a registered trademark of Dalet Digital Media Systems. All other products and trademarks mentioned herein belong to their respective owners.